Night clubs, Ivy League schools, gigantic milkshakes. All of these things thrive, to some extent, on scarcity. The harder it is to get something, the more we want it. In psychology, this is known as the scarcity principle, which states that opportunities seem more valuable when they are less available. Scarcity is one of Cialdini’s weapons for influence, and for good reason. It’s a tactic that’s incredibly pervasive and effective for fueling demand. When I stop to think about it, I marvel at the scary amount of power that scarcity has on my decisions. If I see that a concert is sold out, I want to go all the more. In bakeries, I always opt for the pastry in the lowest stock. I eagerly wait months for a seat to open up at a new restaurant just so I can eventually spend an egregious amount of money on a meal. Software products are no exception. Some of the most popular products out there today, including Facebook and Airbnb, use scarcity to make us engage with their products time and time again. Here’s a look at 4 ways in which successful products have used the scarcity principle to drive crazy product growth and generate continuous demand. Facebook’s beginnings have been well-documented by now. Facebook selectively broadened from a network for Harvard students to include all college students, high school students, international students, and select work networks before opening up to the general public. By that time, Facebook already had 6 million users. By limiting growth to specific networks, Facebook built up demand, which probably helped enrich each new network it added. As a high school student in Boston, I first heard of Facebook as something you could only join if you were invited by a Harvard student. We were all soon waiting for an invite from older siblings of friends of friends. It’s hard to say what would have happened if Facebook didn’t limit sign-up. But looking back at Facebook’s early traction, it’s clear that exclusivity was one of its differentiating qualities. Some had even speculated that opening up the service would be risky to the young startup’s growth. Quibb is an online network for professionals to share what they read for work. While LinkedIn prides itself on being the “world’s largest professional network,” Quibb boasts a smaller, higher-quality community. Quibb is member-only and accepts only 41% of people who apply. For busy professionals who are inundated by the amount of content out there, Quibb’s filtering of curated people, and therefore highly curated content, can provide a lot of value. Gilt City is an online retailer that sells discounted fashion items and local services, often as special deals or discounts. It’s similar to Groupon, but the focus is on higher-end goods. Gilt’s early promotions were flash sales for clothing and accessories. To access sales, users had to become members either through invitation or waitlist. Here’s an email I received after putting my name on the waitlist way back in 2010. 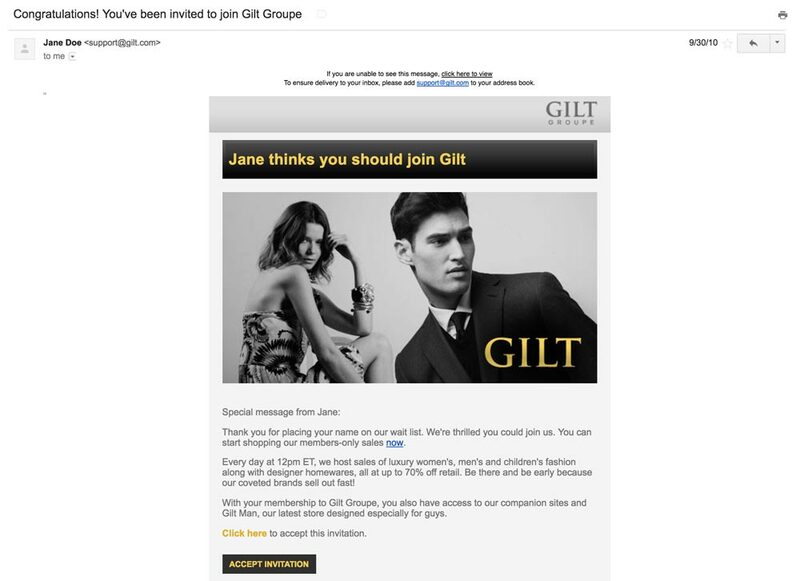 Like Facebook, Gilt has since opened up its membership to everyone, but its deals still hinge on an official time limit. Many travel services like to remind people that plane tickets and hotel rooms are inherently limited in supply. Taking away something, or making something that once was accessible inaccessible is a powerful way to call on the scarcity principle. Things that become less available are actually seen as more valuable than things that have always been unavailable. 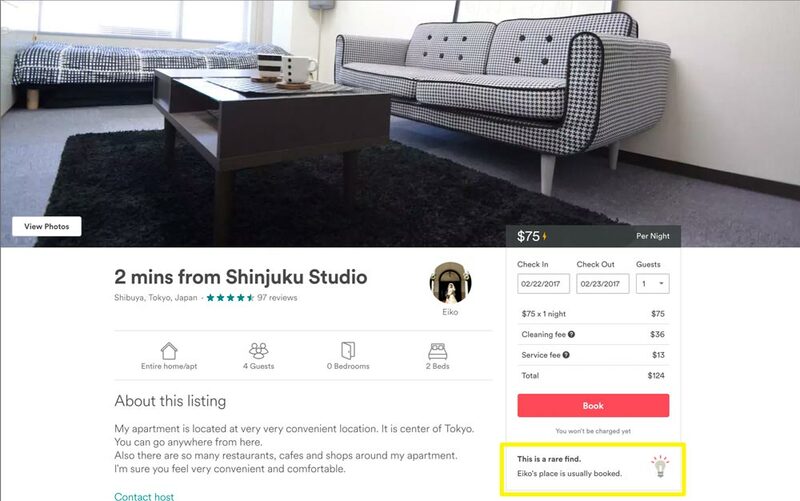 Airbnb has a few messages to trigger this feeling. One is to tell users that the place they’re looking at is a rare find. This feels like a compliment and warning all in one: you better act soon before someone else takes away your discovery. 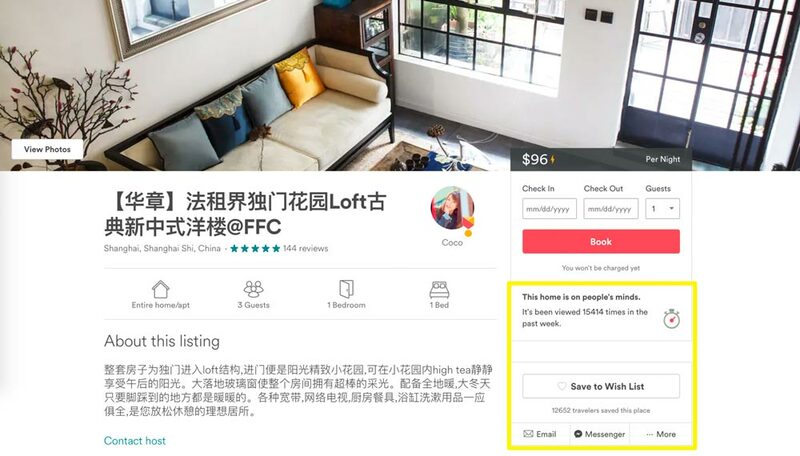 The other message that Airbnb commonly uses is “this home is on people’s minds.” By showing how popular the home is through view count and a not-so-subtle stopwatch, Airbnb nudges users to book soon, before tens of thousands of other people take action first. The hint of competition also makes scarce resources seem all the more attractive. While it’s simple, it works. I often act with a little more haste when I think that I might lose a great travel deal to someone else. Mailbox was a mobile app for email management that Dropbox acquired for $100 million. Even though Dropbox eventually shut down the service, Mailbox’s growth strategy still stands to be admired. 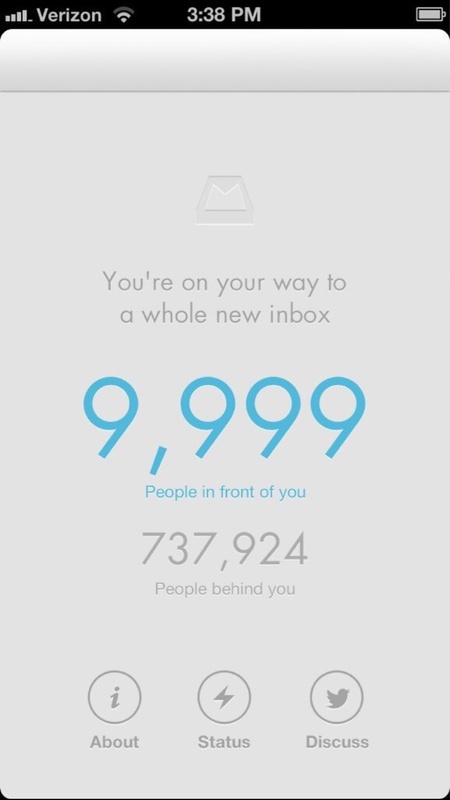 Prior to its launch, Mailbox generated a huge amount of buzz with its waitlist. After users registered, they found out what place they were in line and how many people were behind them. Part of the fun in waiting was being able to commiserate collectively—Mailbox encouraged users to share and discuss right on the screen—and feel better about not being last in line. 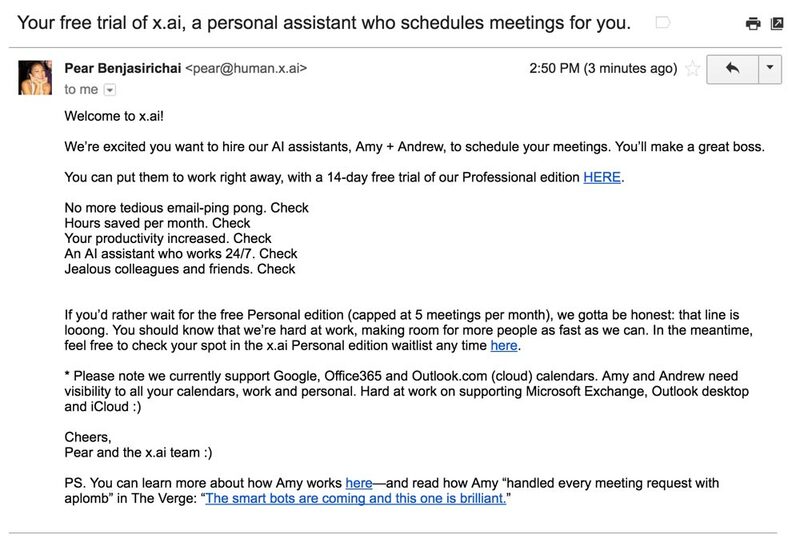 X.ai is an AI-powered personal assistant for scheduling meetings. There’s currently a waitlist to use the service. I recently signed up and was placed into Group 295. 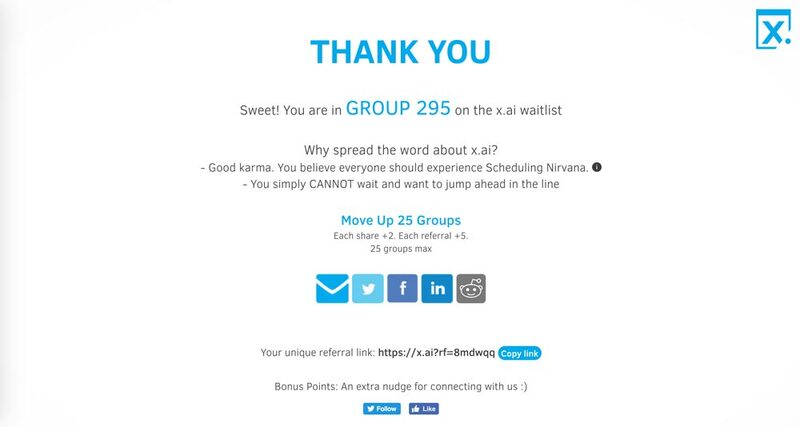 While it’s unclear how long the wait time will be, x.ai takes advantage of your desire to try the product by incentiving you to refer friends and connect on social media for a shorter wait time. Just moving up a long line might not be enough for the most enthusiastic early adopters. Minutes after joining the waitlist, I was offered a free trial of x.ai’s paid, professional version. X.ai’s encouragement of social shares and the immediate upsell both trade earlier access to the product in exchange for something. As seen in the x.ai example, offering an incentive or reward for a desirable user behavior is a common tactic. Mint, in its early days, took it up a notch and put a genius spin on reciprocity. Prior to launching, Mint’s team set out to create viral content. At the time, personal finance advice for young professionals was an untapped market, which Mint’s product and content zeroed in on. Thanks to content and PR efforts, Mint built up an email list of 20-30k people who wanted to try the service. To determine who to give access to first, Mint created “I want Mint” badges for people to display on their blogs. These badges not only spread the word about Mint even more, but it also gave their content more SEO authority. Making a product scarce or exclusive means that the product becomes less accessible, but the buzz that’s generated from being a sought-after item can often be worth it. The great thing about the scarcity principle is how versatile it can be. Limiting sign-ups and early accessibility can jumpstart early growth, as in the case of Facebook and x.ai. 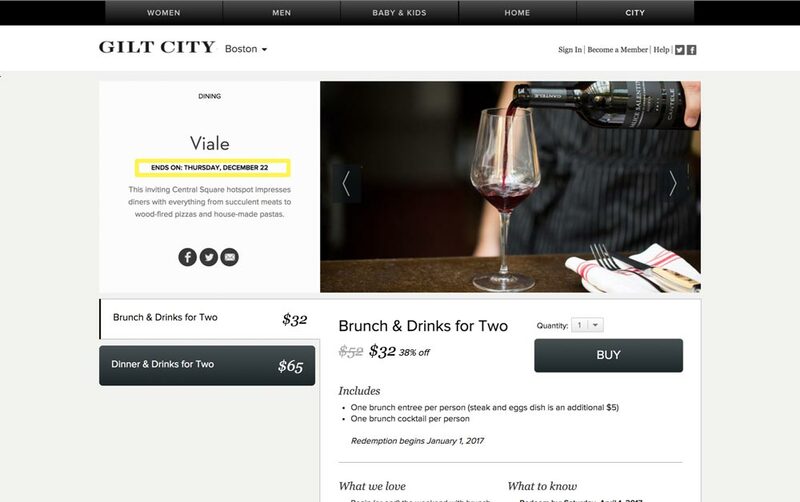 Scarcity can also be used to speed up, or nudge, desirable user actions for mature products like Airbnb and Gilt City. It’s no secret that we humans love the chase, but one crucial thing to remember about scarcity is to use it honestly. According to Dr. Cialdini's work, if scarcity does not truly exist, using it can sabotage all influence attempts. Regardless of what stage of growth your product is in, scarcity can help make it appear a bit more desireable, as long as it's used wisely.